Seeing how our softball season ended in August, it was time for our year-ender... at the end of November. Yes, it was long overdue. However, I think Miss Y played a game in the snow, so I guess it isn't too much of a stretch. How can you see the softball in the snow anyways??? Well, I guess it's easier than golfing in the snow I suppose. So where to eat? Since we'd have a large group and with kiddies in tow, we needed something family-friendly, inexpensive and could accommodate us all. 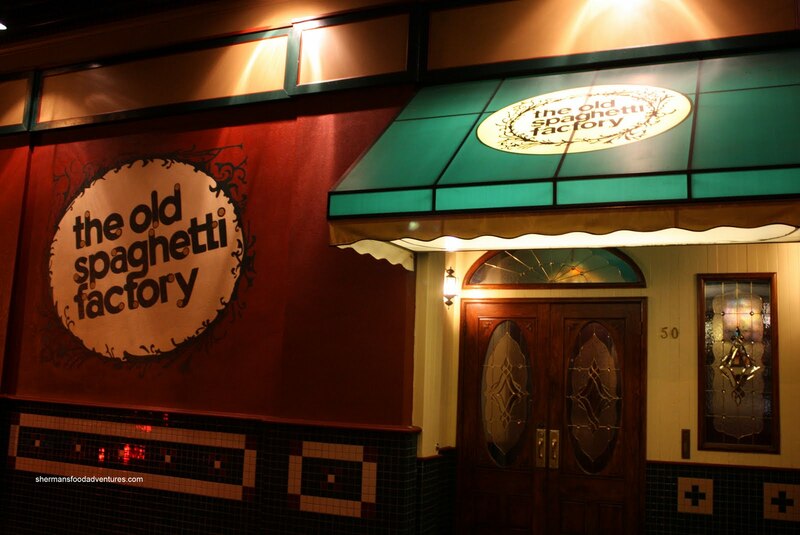 Normally, I wouldn't suggest The Old Spaghetti Factory; yet in this instance, it satisfied all of the aforementioned criteria. Why wouldn't I choose the TOSF as a primary choice? Well, the pasta is not exactly the type I prefer. Now, I won't be too hard on them since they do cater to families. I'm sure my kids won't care if it is gourmet pasta or not. In fact, they would be much more comfortable with spaghetti smothered in plain tomato sauce rather than some fancy garlic, white wine and olive oil linguine with pine nuts and portobello mushrooms. There would be too many "things" in it for my son. Thus, TOSF serves a purpose and it does it pretty well. Just not a personal favourite of mine, that's all. In fact, I haven't been there in 15 years! So after we settled on TOSF, it was a case of "which location"? Originally, I suggested the Richmond one at Riverport (yah, it was my idea... go figure!). However, Miss Y thought that the New West one would be more accessible for everyone. Hey, who am I to argue that? I'm closer to New West anyways. Boss Woman made the reservation for 5:00pm; but for some reason, Bear thought it was 5:30pm and told Miss Y so. Uh... Like Miss Y needs anymore reasons for being late! She would be late anyways, this just exacerbates the problem. Fortunately, she lives close, so getting lost would not be an issue this time around. Let's just hope she doesn't order something strange like a clubhouse. 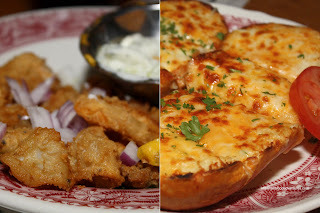 She has a habit of ordering dishes that the restaurant is not known for, such as a quiche at the Red Onion. Good thing we had an early reservation because the place filled up pretty fast and in no time, it was absolutely full. Hence, no matter how many people bash the place (including myself), TOSF does what it does well and we can't dispute that. And what exactly does it do well? How about with every meal (including the kid's meals), soup or salad, beverage, bread and ice c ream are included. Furthermore, most items are on average around $12.00 while the kid's meals are around $6.00. Despite my indifference to the food here, I must admit it is a pretty good value. I have to say I am not indifferent towards the Sourdough Loaf. For complimentary bread, it is pretty good. 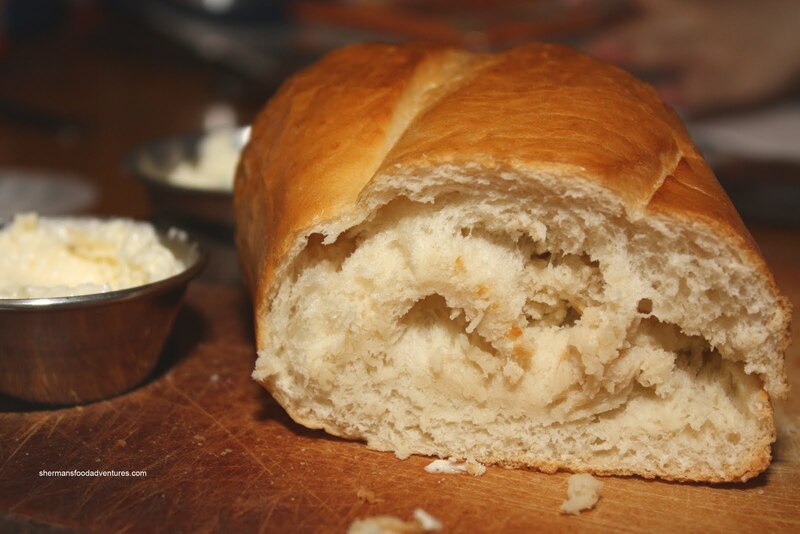 Nice crunchy exterior while soft and warm on the inside, the bread comes with whipped butter and garlic butter. 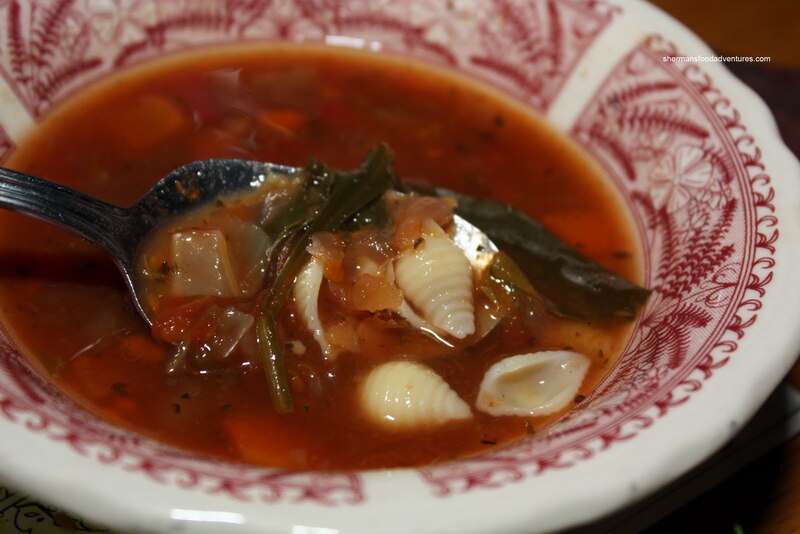 As for the soup, there is a choice of Minestrone, Clam Chowder and Baked Onion with the latter 2 available for an extra $2.00. 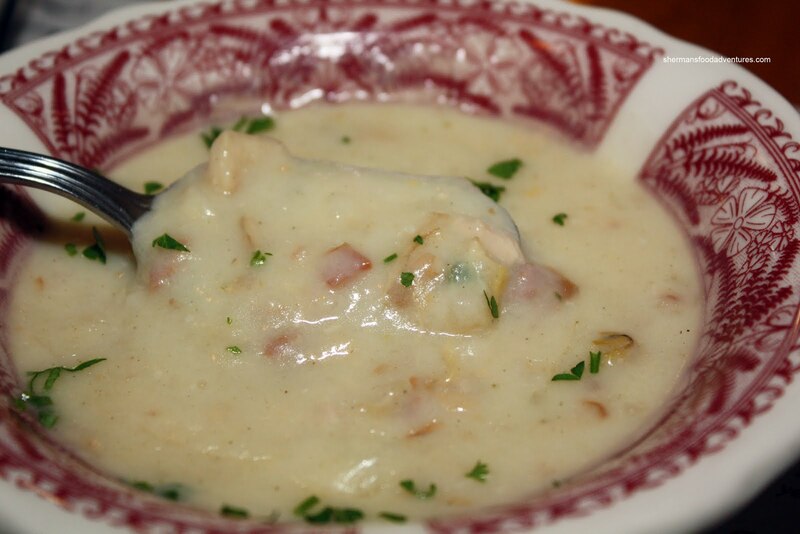 I had the Clam Chowder and it was more floury than creamy. However, it had a good clam flavour with bacon and those clams were tender. Viv had a salad; but ended up finishing the kid's Minestrone (since my son wouldn't eat it anyways). It's more like a vegetable soup than anything. Not bad, it does the job. 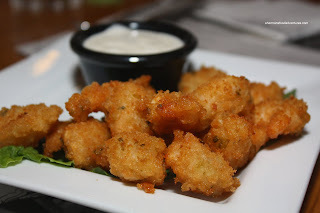 Despite the inclusive meal, I decided to get an order of the Popcorn Shrimp to start. This was surprisingly good. Very crunchy and none too oily. We didn't really like the dip though, it was ranch and did not compliment the shrimp very much. 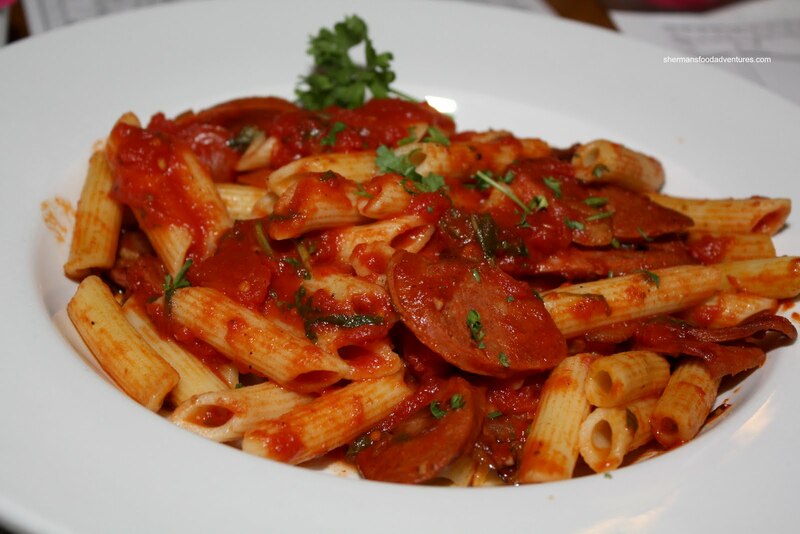 With that in mind, Viv got the Chorizo Penne. For me, the first thing that came to my mind was "Boston Pizza". Not necessarily a good thing either. However, there was okay flavour with some spiciness and tartness. The chorizo was alright as well; yet the whole darn thing was "meh". Pasta was overcooked and it is definitely something I could do better at home. I was having a hard time deciding, so I ended up with the Pot-Pourri Spaghetti which has a combination of 3 sauces - Meat, Mushroom and Clam. Once again, the pasta was far from al dente. On that note, I do understand that TOSF is a family restaurant; thus al dente pasta may not be very kid-friendly. With that being said, overdone pasta is not something I personally like. 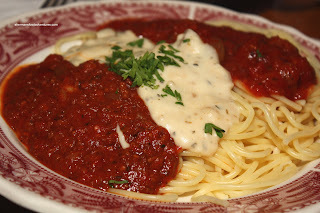 I've had this dish before and since the sauces are on top of one pile of spaghetti, it is impossible to eat them separately. What you ultimately end up with is a mixture of all three. It would help if each sauce rested on top of 3 separate spaghetti bundles. Nothing particularly exciting about the sauces. The tomato sauces are predictably tart and very little in the way of depth. The bechamel clam sauce is quite thick and not really my cup of tea; but it's edible. We ended up getting 2 kid's meals with my daughter having the Chicken Dippers and Fries. 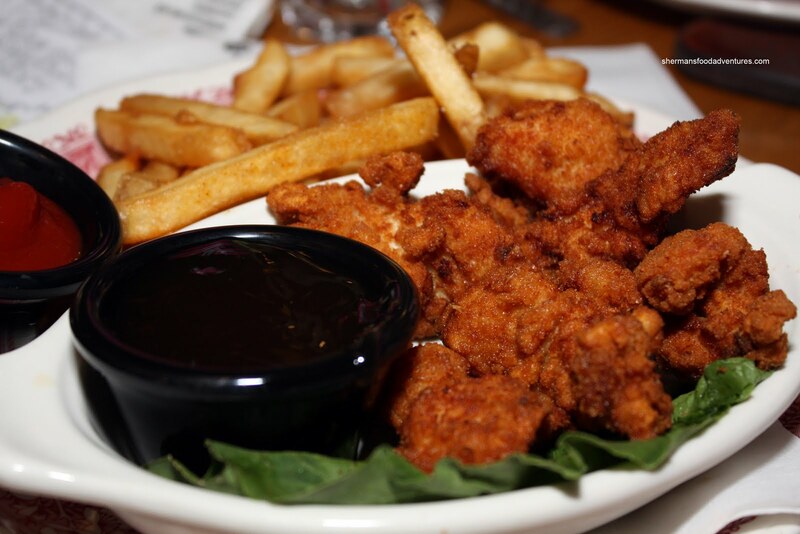 Much like the popcorn chicken, the chicken was fried perfectly. Good colour and crunch with the chicken being juicy and tender. I guess they know how to fry things here. My son had the Spaghetti with tomato sauce. 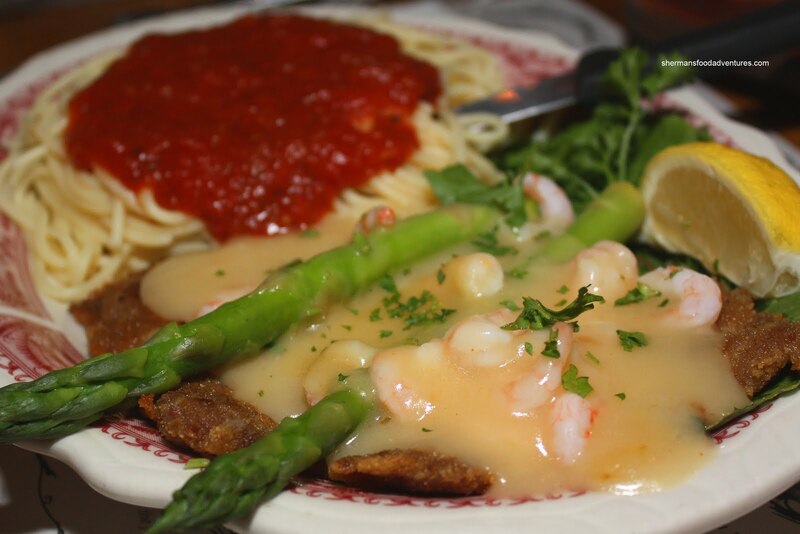 No picture necessary, it looked much like all the other plates of food with spaghetti. Believe it or not, he actually ate a good amount. See what I mean as in being a kid-friendly restaurant? Milhouse, who is not a kid (well, according to him only), was very indifferent about his Chicken Neptune. He thought the veal was overly salty and greasy. Also, the Hollandaise was not really a Hollandaise in his eyes. As you can see in the picture, it sure doesn't look like Hollandaise. He also didn't think much of the overcooked spaghetti and as I quote, "tomato sauce you can get out of a jar of Ragu". Ouch... But I can't argue with him there! For some reason, Hot Chocolate decided to go for 2 appetizers instead of any pasta. Maybe she knows better? She had the Calamari first and it was merely passable. It was overly greasy and frankly had not much flavour. I gave it a try and yah, pretty average. Tzatziki sauce could've used more garlic. She went with the Garlic Cheese Bread as her second appy. She thought the cheese bread had some white cheese sauce underneath that was too much; but the edges were crispy. If you can get over the artery clogging part, it's great for sharing. 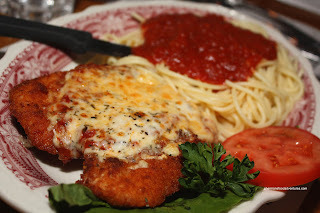 Judes opted for the classic Chicken Parmigiana with spaghetti. Although the chicken was dry and the pasta was overcooked, she echoed the same sentiment - it was okay for the price. With that being said, the breading was still crispy and the inclusion of salad, bread, drink and dessert makes one forget about the negatives. Sienna ordered something that I considered at first. 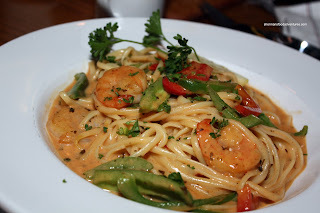 Now don't laugh, it was the Thai Curry Linguine. Yah, the chances of this dish working out is as good as finding great pasta at a Hong Kong-style cafe. Seriously, I wanted to try it to see how bad it could be. On the contrary, Sienna actually liked it. No, she's not crazy nor unfamiliar with Asian food. Rather, she went in with reasonable expectations and the final product was not offensive. The pasta was al dente while the sauce was flavourful with a bit of spice. The shrimp was cooked nicely while by looking at it, there was probably too much sauce. With that being said, it was probably better than what I had. Boss Woman ended up with the Meat Lasagna. 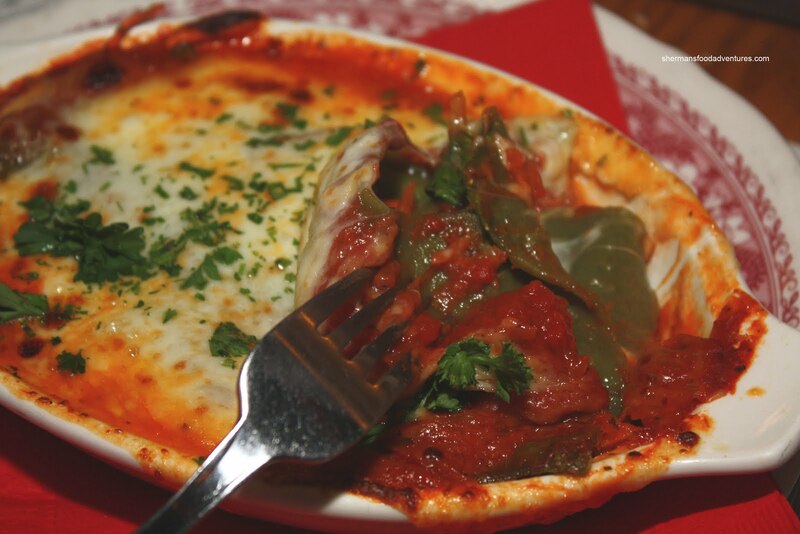 You might be wondering why the picture is of a vegetarian lasagna then. Well, the picture of the veggie one turned out better, otherwise, the 2 are practically the same except for the meat. Boss Woman didn't feel there was that much in the way of meat in her lasagna and remarked that it was passable. Lots of cheese and sauce though. 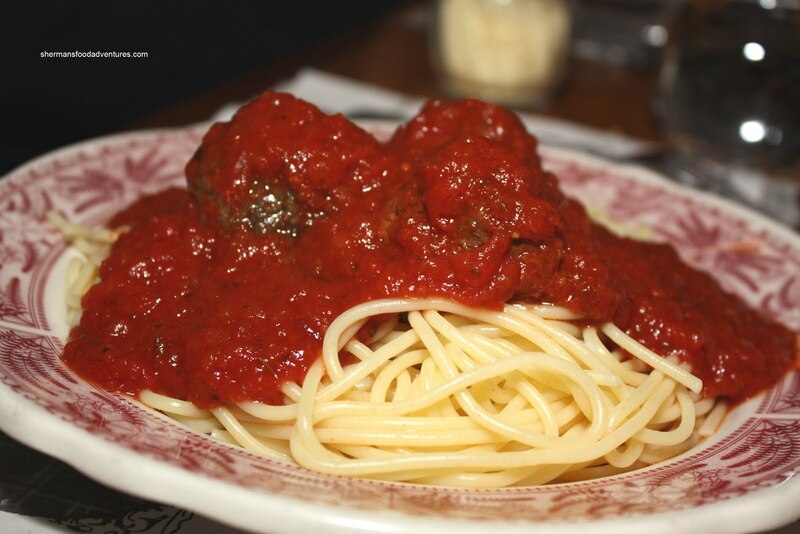 Mr. Blueberry decided to go for the classic which was the Spaghetti and Meatballs. Reminiscent of the one we had at Nick's, this was ol' skool pasta. Slightly overdone spaghetti with the same tart pasta sauce. He didn't mind the meatballs though. They were well-seasoned and relatively moist. He thought the portion could be bigger; but the portion did fit the price. 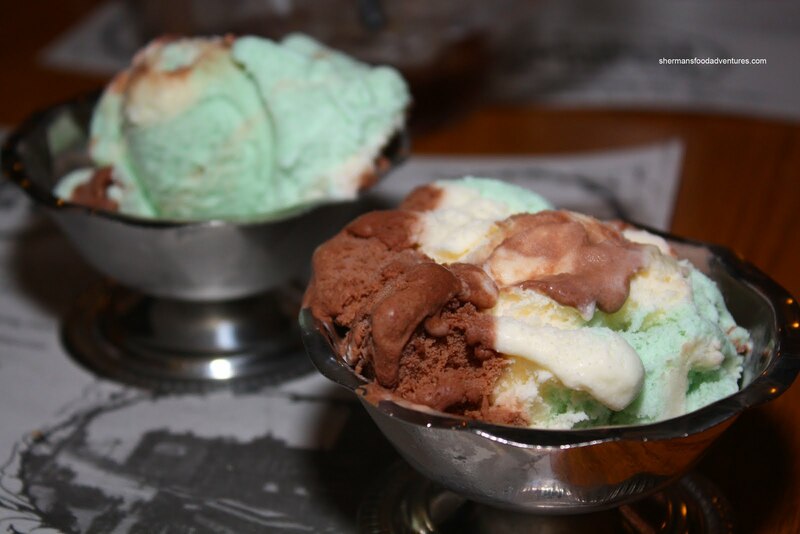 At the end of the meal, like any meal at the Old Spaghetti Factory, we all got a scoop of Spumoni Ice Cream. Oh yeah, that brought back so many childhood memories. And that is probably what makes TOSF successful. It really hasn't changed much in terms of decor, food and even pricing (hasn't gone up very much). Where else can you get a complete meal for around $10.00? Yah, I know, the pasta here ain't exactly gourmet. In fact, it is probably as far from gourmet as you can get. However, let me do a comparison. The pasta is similar to Nick's (as much as some people might disagree with me); yet it costs half the price. It is most certainly less expensive than Boston Pizza and don't even get me started on their pasta! So really, as much as I want to hate TOSF for its overcooked pasta with canned-like sauce, I remain indifferent. The location in New West is a bit frightening! Yikes, Shermie! This post brings back some nasty memories. My last trip was also back in the nineties. Ordered the Linguine Vongole. Got a plate of noodles with a viscous, snot-like sauce. The server came by to check on us. I looked at my plate then looked at her. No words were spoken. She took my plate away. Even after that I'd still go back if just for the unlimited fresh bread and garlic butter. Nope, haven't had that before Elaine! Probably not going to either!